At United Regional we treat a variety of hip and knee conditions. Arthritis and insufficient blood flow can often be treated through surgery and physical therapy. Hip fractures often lead to total hip replacement because less than 50% of those who suffer a hip fracture are able to return to their normal level of activity. 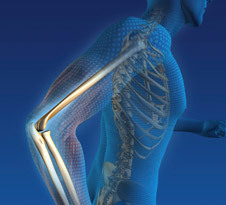 These soft tissue injuries are often corrected by minimally-invasive surgical procedures and physical therapy programs. However, with a severe knee injury or chronic pain, a total knee replacement may be required.